Do you have any Family Ties mementos such as a script or candid set photos? Cindy Fisher (s1): I'm sure I do somewhere in the garage. A camera on the set would have been unprofessional/prohibited and just wasn't done. Kaleena Kiff (s2): I have black and white 8x10s of me on set that a photographer gifted to me. Kate Vernon (s2): Gosh. I don't think I do. I have saved some scripts since but I don't think I knew enough [to do so] back then. 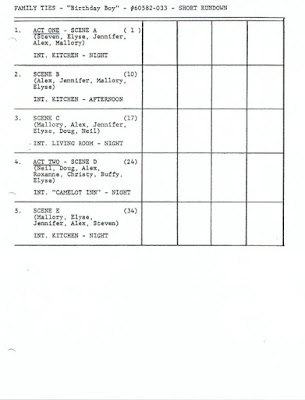 Eileen Seeley (s2): I do still have a copy of the call sheet and script from our episode. I had a script that was signed by the cast, but after numerous moves, it is MIA. 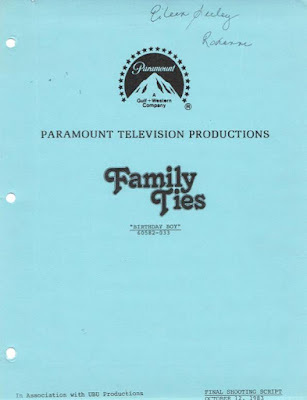 Debbie Gilbert (now Webb) (s2): I had nothing for a very long time because I had read somewhere it was bad feng shui to hold on to mementos from the past, and then this year Eileen gave me a copy of the script as a gift. I gave it to my daughter so she would connect that someone wrote those lines. When she asks me a serious question, I often tease her and think real hard, finally saying "I dunno" [MTN: as her Family Ties character did]. Susan Isaacs (s2): I wish I did. I was so young and green, I was afraid to do anything untoward. So they're only in my mind. Kathleen Wilhoite (s2): No, actually, I don't. My basement flooded a few years ago and I lost a ton of memorabilia to mold and mildew. Lenora May (s2): I'm sure I have some photos, but where they are is the question. Alan Blumenfeld (s2, 3, 4, 5, 6): God no. I used to have a champagne flute from one of the Christmases. It had a Family Ties logo on it. Timothy Busfield (s3, 5): I don't have any from anything. 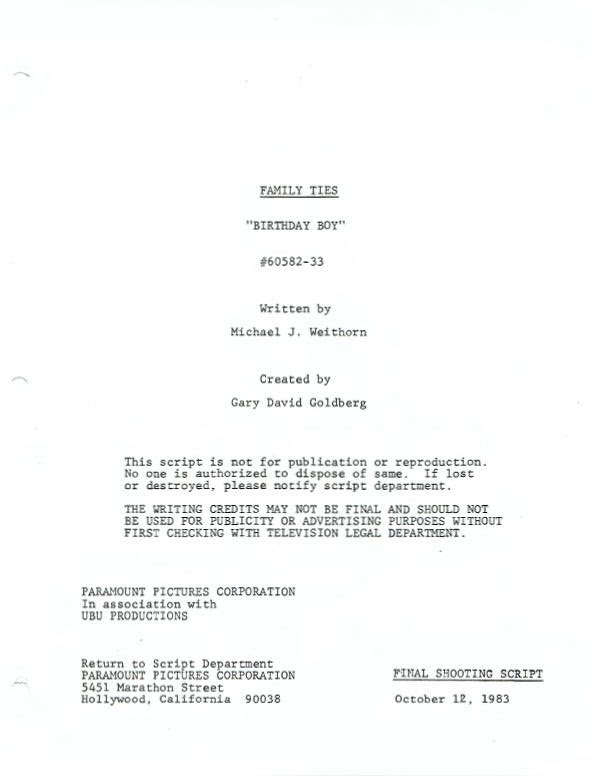 Maybe a script or two from thirtysomething. I'm not an in-the-past guy. 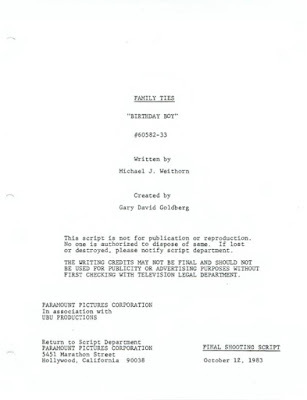 Norman Parker (s3, 5, 6): Somewhere in a box marked "memorabilia" in our basement are several of my scripts from the show with all my notes in the margins, which I'm sure would bring back a flood of memories if ever I find the time to unearth it. I also have (hope I still have) a set of champagne flutes given to us by NBC at the final party celebrating the end of the seven-year run of the show. If anyone else has them, let me know and we will get together and knock off a bottle of champagne while reminiscing fondly on Ties and the Family. Adam Carl (s3): Somewhere I have a copy of the script and an 8x10 cast photo that everyone signed for me. Where those items are, however, is anybody's guess. I'm pretty sure I used to have the photo framed. Gracie Harrison (s4): I gave my script, with autographs from the cast, to my sister as a gift. "Paper Chase" was the last show of the season that year. There were buttons given out for entry to the after-party. I'm not one to keep souvenirs from my acting days, but I did save that button. It's somewhere in storage, but I can't find it. "Dear Virginia, You've got a great sister so you must (underlined three times) be a lovely person. Scott Valentine"
"Virginia, All the best, Love, Michael J. Fox"
"To Virginia, Love your friend, Tina Yothers"
"To Virginia, Best Wishes, Tracy Pollan"
Jonna Lee Pangburn (s5): I have a lovely Ubu pin from a Family Ties Christmas party! Brian McNamara (s5): I got to keep my Cleveland Indians ball cap! Stuart Pankin (s5): I don't even have that calendar. I looked for it for a long time, but when we moved, it disappeared into the void where old TV comedies go to rest. And I don't think I ever had set photos. 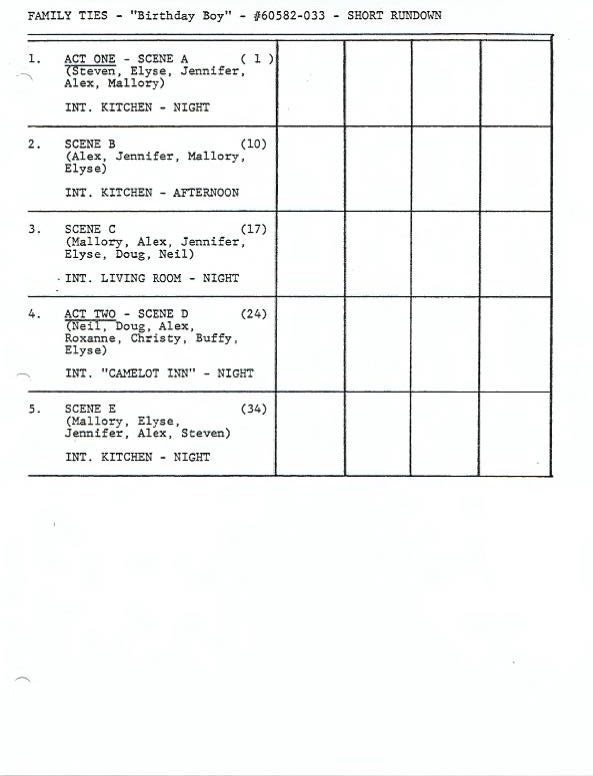 Dana Andersen Schreiner (s5): I have a script buried somewhere, but no photos. Nicole Nourmand (s5): I do. I'm not sure where the pictures are but I know I had a really great photo of Michael Gross hugging me. Ellen Latzen (s6): I had a Family Ties T-shirt for years, but I wore it so much I think it pretty much disintegrated right off of my body. Victor DiMattia (s6): Both, I think. All that stuff is with my dad and he [recently] moved. I've got him looking. Fingers crossed. John Putch (s1, 2, 5): "How on earth did Marc take this long to get in touch?" Terry Wills (s1, 2, 5, 6, 7): A guy writing a book. Kaleena Kiff (s2): I laughed and then tried to remember that far back! Kate Vernon (s2): I thought it was really cool. It launched Michael and he's such a special human being. It's such a special show. It should have special attention. Eileen Seeley (s2): It was a bit convoluted as I heard from/about you through the production team I worked with on Nunsense. They each checked you out online before sending your email on to me. I thought that was very sweet. Debbie Gilbert (now Webb) (s2): Shocked. I tried to seem nonplussed, but how cool! And why? Honestly, I wonder who cares; sure, it was a special time in my life, but not for anybody else! Everyone on that show went on to do some nice work, and wasn't Family Ties just one of many sitcoms from those days, and who cares about the scene with the little blonde at the end of the table? Susan Isaacs (s2): I checked your website to make sure you were legit. I get some odd requests from time to time, so I wanted to make sure you weren't writing me from prison. Kathleen Wilhoite (s2): "Wow, that was a long time ago. I bet he has a hard time drumming up information." I barely remember. But, sincerely, good luck to you. I hope this works out. Lenora May (s2): I'm always tickled to hear from folks who are doing [nostalgia] projects on productions I've been in. This is my third this year. The others were Jaws 2 and Little House on the Prairie. Alan Blumenfeld (s2, 3, 4, 5, 6): I am always surprised that anyone cares about what I think. (laughs) My last big show was Heroes and that was seven years ago. I thought "Are you kidding? Why does he want to talk to me?" My wife said "Because he grew up watching you on TV." I'm 65 and moved to L.A. when I was 30 so those were my formative years learning how TV is made. I am proud to have worked with people who shaped the medium. I think it was a time when TV was really remarkable and I don't think it was remarkable again until just recently. Nancy Everhard (now Amandes) (s3): I was happy to try and help with my memories about the show. It was a good week for me when we shot it. Norman Parker (s3, 5, 6): I thought what a good idea! How can I refuse this guy. Adam Carl (s3): I thought, "Oh my God, I hope I can remember enough to make this worth it to Marc." I also thought, "Marc needs to get out more." Suzanne Snyder (s4): I am always surprised when I hear from people that are interested in my past acting experiences. I don't talk or think about my past often. Gracie Harrison (s4): Since your name wasn't familiar, I googled you and researched all the links you provided! Robin Morse (s5): To be honest, I thought "uh oh, who is this guy"…but then I decided to treat it as an opportunity to give back, to express my gratitude for such a rewarding experience. Jonna Lee Pangburn (s5): It has been a very long time since I really thought about acting. I am asked about it fairly regularly and remember it with a fond haze. Honestly, it was a job. A sitcom was five days out of 10 years of work. In general, I remember this particular show as being really well-organized with an incredibly welcoming and gracious cast and crew. For the most part, everyone was thrilled to have a fun week with new faces but continued on with their incredibly professional and friendly routine. Brian McNamara (s5): I loved that you're doing this story. Sonia Curtis (s5, 6): I was honored. Thank you! Stuart Pankin (s5): "Dear God, how did he get my number? Is he a mad stalker? Do I have to move?" But a quick call to the FBI assured me you were legitimate. And I also thought it would be fun to revisit Family Ties. Dana Andersen Schreiner (s5): I just ignored it. It took my friend forwarding your email to her that made me start to take it seriously. I'm also really bad at answering email and Facebook messages so it was easy to ignore. Sorry. Nicole Nourmand (s5): I was surprised because my role was pretty small. I was on only two episodes. Jason Naylor (s6, 7): I wasn't sure that time would permit me to participate, but I found the notion amusing. Ellen Latzen (s6): I have to admit, I wasn't sure whether or not you were legit. It's nothing personal, I get a lot of people reaching out to me for various reasons relating to my career. But from what you've told me, as well as the research I've done, you seem accomplished and qualified to take on this subject matter. I look forward to seeing the finished product! Darrell Thomas Utley (s6): I wondered why someone would be interested to get in touch with me as I was not a famous actor. I haven't been in the industry for so long. It was a curious situation, haha. Susan Kohler (s6): "What a great idea." This was an important show in the history of television. Danielle von Zerneck (s6): I don't understand the question really. These inquiries come in occasionally. When I was an actress I was lucky enough to have been in a few things that were or have become iconic. But I did quit acting almost two decades ago so it does feel very removed. I don't think about my acting experiences very much. Hilary Shepard (s7): "What the hell is wrong with this guy?" Also, I was in only one episode so wasn't sure what I could contribute. Nick Rutherford (s7): "I'm not giving this guy my bank account info." Byron Thames (s7): I thought I would be glad to help you. Even though it's probably not much help at all! How do you look back on your Family Ties experience? Cindy Fisher (s1): Brief and fun. I still think the name was dumb. [But] hard to argue with success. John Putch (s1, 2, 5): Super fun and historical. I appeared on a lot of historical TV in the '70s and '80s. My first appearance was on All in the Family. I also had a solo song on the ill-fated Cop Rock by Steven Bochco. Chris Hebert (s1, 2): Very fond memories. It was a different sitcom experience as both of these shows were not filmed with an audience because of the set changes and special effects. But I remember that everybody really was striving to do quality work in a fledgling show that has now become a TV classic. No grudges, no bad blood, no egos, no nothing like that. Terry Wills (s1, 2, 5, 6, 7): It was fun and I was happy to be one of the Gary Goldberg Repertory Players. Edward Edwards (s2): It was absolutely one of the best experiences in my career. I was given such freedom on set during rehearsals and a lot of my improvised lines and actions ended up in the script. Gary was the leader in making everyone feel they were important team players and the result was a true collaboration of wonderful artists, writers, and director Sam Weisman. Kaleena Kiff (s2): It was sweet and easy. Eileen Seeley (s2): Thankful! I could not have asked for a more wonderful introduction to Hollywood. Debbie Gilbert (now Webb) (s2): It was a time of Hollywood that was delicious. I am so grateful to be able to say "I tried, and I did work." Susan Isaacs (s2): Bittersweet. So long ago. "If I knew then what I know now…" I would have followed Paul's advice and ditched acting for writing from the get-go. It's such a hard business. Actors are pawns. If you're going to be an actor, you have to create material for yourself or you're going to be cog in a wheel. As was I. I got smart too late in the game. Kathleen Wilhoite (s2): I look back fondly on my Family Ties experience. It was one week out of my life over thirty years ago, so I don't actually look back on it much, maybe haven't ever, until you sent me these questions. 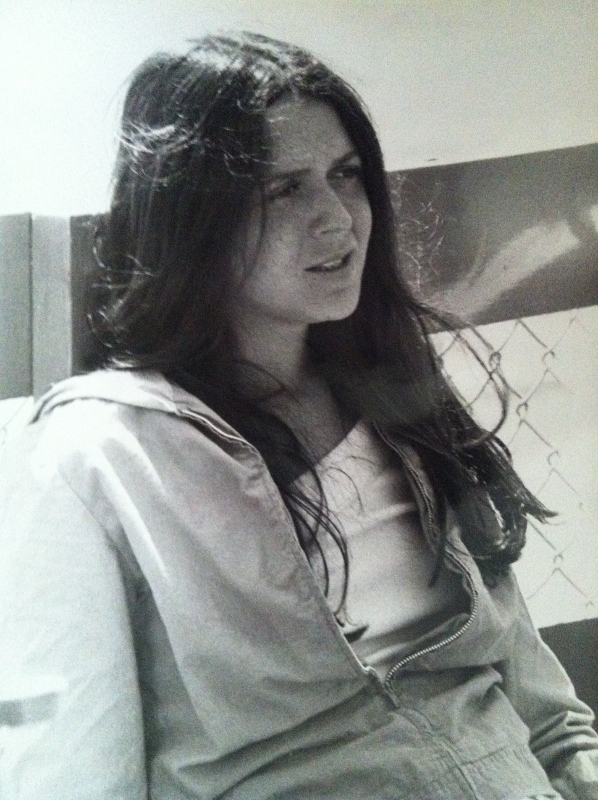 Lenora May (s2): It was fun, of course, and as I said, my last teen role, so a little sad, too. Matthew Barry (s3): It boosted the hell out of my confidence and I started booking again. Lily Mariye (s3): I was really excited and grateful to be on such a hit show. I learned a lot about comedy and I had a lot of fun. But we had no idea it would remain such an icon of television while we were doing it. I'm happy to have been part of television history. Norman Parker (s3, 5, 6): It's the nature of the beast that many projects over the life of the actor are "jobs" we are grateful for, but just not that meaningful. If we are lucky, a few, as was Family Ties for me, come to us as a special gift we know we will always cherish and be proud to have been a part of. Adam Carl (s3): It's 100% a positive experience in my mind. I had a great couple of weeks working with wonderful actors on what was then one of my favorite shows. It was a thrill. Robin Morse (s5): With tremendous gratitude. Jonna Lee Pangburn (s5): Fun with serious bouts of silliness! Very warm. 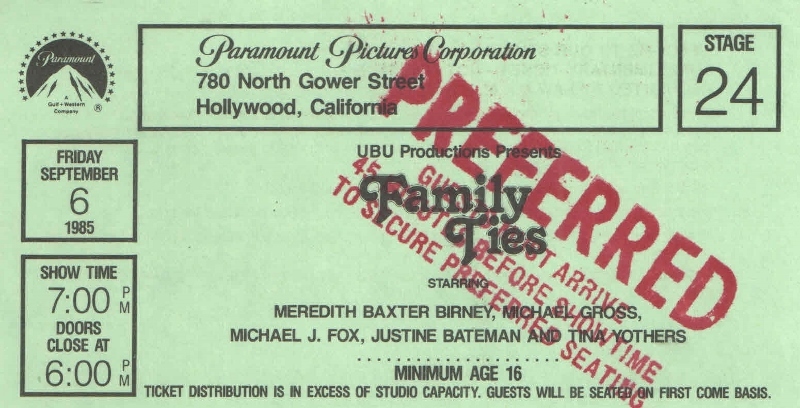 The cast and crew were definitely a "family" and managed to make everyone (at least me!) feel like a part of their extended family with strong ties. I have nothing but warm memories and gracious thought about the team that made this wonderful production. Brian McNamara (s5): A true highlight in a long and wonderful career. I've always been proud of entertaining audiences and being a part of television history. I'm particularly proud to have done this moving episode of this extraordinary show. Sonia Curtis (s5, 6): Very fondly. I am very proud to have been on the show. I just wish the producers made the spinoff series about Skippy and I that they decided to do after my first episode! They ended up contracting me to do another 7 out of 13 episodes, but shifted focus to bring Michael J. Fox a new girlfriend. That was Courteney Cox. She was super sweet and gave me a Christmas gift after working only a couple episodes. Stuart Pankin (s5): Really positively. Only downside: I think the residuals have stopped. Dana Andersen Schreiner (s5): It was great. Everyone was friendly and welcoming. It was a very nice set to be on. There was no tension on set and everyone seemed to love working with each other. It was the last show of that season so people seemed to be extra sentimental. I've been on some sets where the tension between the writers and the actors has been thick and they were usually unhappy places to work (except for the fact that you're making money). Nicole Nourmand (s5): I look back on my experience very fondly. It was super fun and a great growth experience. Ellen Latzen (s6): It was one of the highlights of my career. It taught me valuable lessons about how to act in front of a live audience, it gave me my first taste of working on a studio lot, it was my introduction to comedy performance, and it was on a show that I adored. The week I spent on the Family Ties set was one that I have treasured for the past 29 years, and will continue to for the rest of my life. Victor DiMattia (s6): I look back on that whole period of my life with a lot of fondness. It was a truly great experience and I had a ton of fun. Darrell Thomas Utley (s6): It was an awesome opportunity for me to get [into] Hollywood. 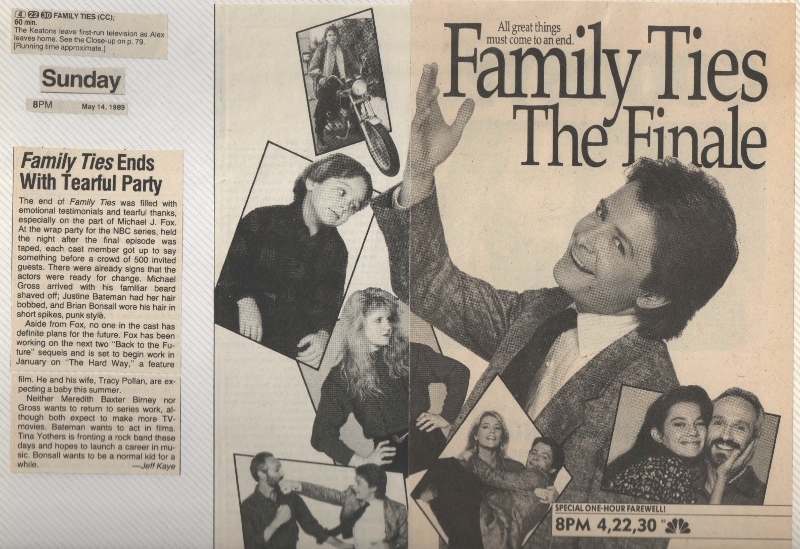 My child acting career spanned for 10 years after Family Ties, a kick starter to that engine. I got overwhelmed with the so-called fame at times and it was a learning experience for me. Susan Kohler (s6): I am grateful that I was a small part of historic television. I will always remember the week I worked the show. Danielle von Zerneck (s6): I was grateful for the job and looking back grateful to have been a teeny tiny part of a groundbreaking show at a really interesting time in its history. Hilary Shepard (s7): It was one of the first sitcoms I ever did and I loved the whole thing—like shooting a mini-play in front of a live audience with a bunch of actors who loved each other and really knew what they were doing. Christina Pickles (s7): A marvelous experience. A lovely script. Sensitive but funny—not always an easy combination. Mathew Perry told me that I was lucky to be on two of the best shows ever on TV—Friends and St. Elsewhere. Well, I consider myself lucky to also have been on Family Ties because that show was of the same temperament—real, human, kind, touching, valuing all the good and decent things about family and people…and funny, too. Nick Rutherford (s7): I remember being slightly bummed that my part was pretaped because there was nothing like performing in front of the live studio audience. Ultimately it was fun. I always enjoyed being on set, and [when you're] a little kid, everyone is incredibly nice to you. The show was a well-oiled machine by the time I made an appearance so it went smoothly and easy. Cindy Fisher (s1): Never really any good at math. Lisa Lucas (s1): At that same time, I did Facts of Life and I get some of the memories confused. I remember Blair [Lisa Whelchel's character on Facts of Life] constantly eating bagels and other things at the craft services table. But that doesn't apply to Family Ties. Earl Boen (s1, 3): It was a very good show, especially when compared to what passes for situation comedy now. Very friendly and professional cast and writers. When they called me back for that second time I didn't have to read for it so I guess I did something right the first time. They were very accommodating when I needed to go on an audition during lunch, for example. Some shows wouldn't do that—"we're paying you for the week." Paramount had great munchies in the morning! Lox and bagels and cream cheese and green peppers—jalapeños. They cut them very thin. I became addicted to them! Terry Wills (s1, 2, 5, 6, 7): I still get residuals now and then. I guess it was a big hit. Debbie Gilbert (now Webb) (s2): I have shared my acting chapter. I have not given up on a next chapter, and so I pitch my husband shows when I have him cornered—usually when he is on the toilet seat. My daughter says I am too old to do anything, anything at all, except be her mom. Tom Byrd (s2): I heard long ago that episode apparently garnered kudos from some organization that promotes teenage virginity. I figured as a former horny teenager I was glad to help out. Susan Isaacs (s2): I really connected with one of the producers on the show, Ken Hecht. Maybe I mentioned I was still in film school, so he didn't treat me like some airhead actress who'd come to town on a beauty pageant float. After the episode was over, I met with him in his office at least once. He'd just let me come in and talk about what I was up to. He encouraged me to keep going and to not forget my writing. He was a very kind and caring man. He didn't have to take that time with me, but he did. I met a lot of really good people on that episode. Alan Blumenfeld (s2, 3, 4, 5, 6): I'm just pleased that people remember the show. Also: go to live theater. Timothy Busfield (s3, 5): RIP Gary Goldberg. Every time I saw him, I would miss him. And I miss the work environment with Michael. Shows like that are a gem that you don't find anymore. Matthew Barry (s3): Much appreciate you doing this. Lily Mariye (s3): My friend Anthony Edwards was in the studio audience on tape day. We met doing children's theater a few years before. He came backstage afterwards and we hung out for a bit before I had to go back to work. Little did we know that we would work together again on ER for many years. 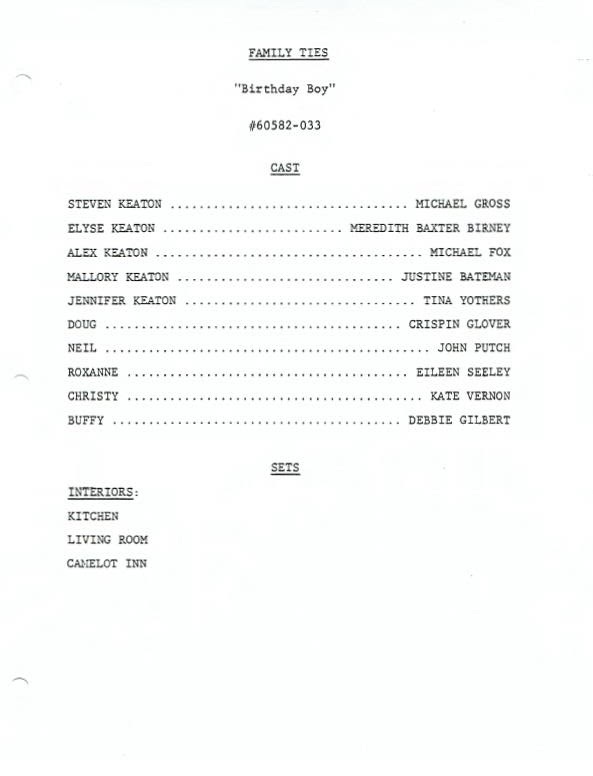 Robert Costanzo (s3, 4, 5, 6): I told Gary that we had a real-life version of Family Ties in our house. We're pretty liberal and I tend to be more leftist but my son Daniel is right-wing. He's Alex P. Keaton all over again! Adam Carl (s3): I appreciate you reaching out and giving me a chance to share my memories. And I'm glad there are guys like you out there helping to highlight and preserve these bits of TV history. Peter Scolari (s4): This was an incredibly balanced set because Gary Goldberg and the actors all pulled in the same direction. 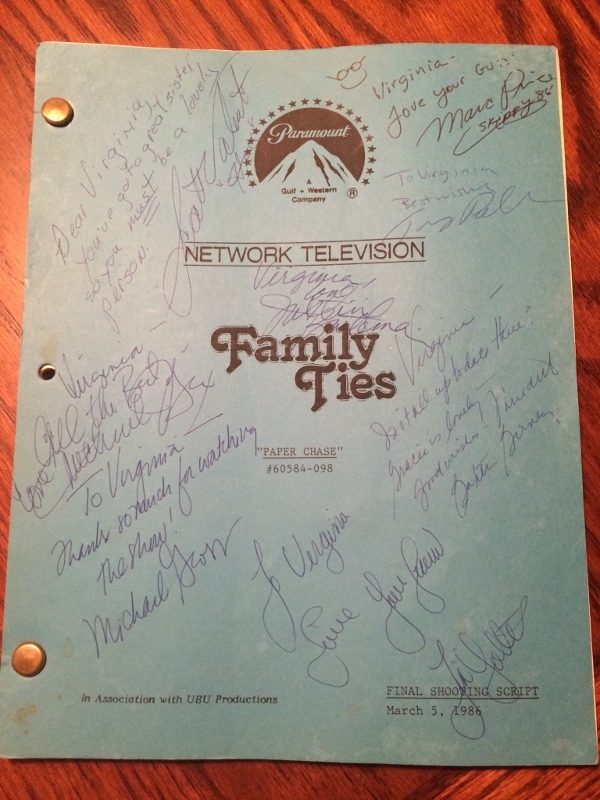 In the back of one of the Family Ties sets, the home set, they had a huge sign-in wall for all the guest actors. 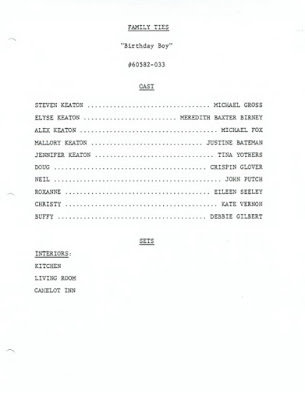 When I signed in, I alluded to the plot of the show itself because my character, Paul, wanted to know how Elyse felt about him: "Forget Paul—I want to know how Meredith feels about me." 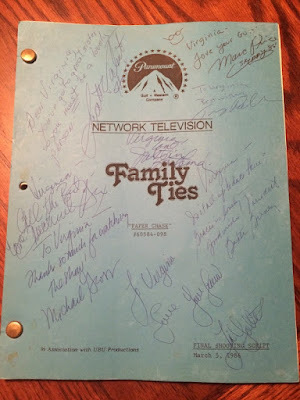 Even if you're successful in this business, you don't have perfect experiences and shouldn't expect to, but my time on Family Ties is among the very few weeks in my career where I was consumed with gratitude. Gracie Harrison (s4): Thank you for finding me. 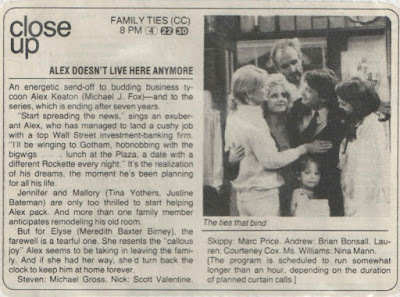 I'm grateful for the opportunity to express the joy that it was to be a member, if only for a week, of the Family Ties family. This has brought back many memories that I haven't thought about in years. Robin Morse (s5): Thank you for asking me to be a part of this. Margaret Nagle (s5): Christina Applegate and Rain Phoenix were guest stars [on my episode] and so sweet. Sonia Curtis (s5, 6): The line producer, Carol Himes, told me she was submitting my name for Emmy Award consideration as a guest star, so that was huge. :) I didn't get the formal nomination but was honored anyways. Stuart Pankin (s5): Yes. Don't ever email me again! Amy Lynne (s5): Sitcoms would always do the Friday night live shows. The room was always packed. I remember the set like it was yesterday. There was a little daycare set up for Meredith's twins. I got a red sweatshirt that had Family Ties on it at the commissary shop. I had it for years and never wanted to part with it. But I don't have it anymore. Jason Naylor (s6, 7): It is remarkable to note the degree of scholarship that has come to be able to applied to such recessed niches of recent popular culture, to say nothing of the fact that any physical published work of cultural history that should come of it stands a very good chance of vastly outliving any and all copies of the actual show itself, given the far greater stability of print matter over digital media. It should perhaps come as no surprise that we, amongst the first generations to be widely exposed to television during our most formative years, would look back upon such shows as played their not inconsiderable part in teaching us the ways of the world and the people in it, both reflecting and reforming our ideas of who we were and could be, with such fond nostalgia. Darrell Thomas Utley (s6): It is nice and refreshing when Hollywood casts an actual deaf person for [a deaf] role. It brings authenticity, and not only that, the community feels validated. It is a constant struggle and frustration for us to see [deaf] roles filled by hearing people who sign awkwardly and are not native to the community. Susan Kohler (s6): Thank you for reaching out to me and helping me reminisce…I'm in my 60s now. Debra Engle (s7): Matthew Diamond was the director. I [saw] him at Bed, Bath, and Beyond just a few weeks after (my mother was there from Illinois that day) and he was so fun to speak with—he was saying that he liked that element I did. Also, hilariously, [today, the day I answered these questions], I got a residuals payment statement from SAG/AFTRA for Family Ties! Only $13.52 [how long ago that was]. I get lots of money from Golden Girls—I was on that three times. Jaclyn Bernstein (s7): Growing up, I worked with a lot of wonderful actors of great shows, from the legendary Michael Landon to the casts of St. Elsewhere and Golden Girls, and Family Ties was the best of the best. This was such a blast to read. Thanks so much for putting this together. I haven't watched the show in forever but with each post I found myself remembering so much more than I thought I would have. Great job reaching out to everyone and corralling all this here for our enjoyment. Thanks for doing this Marc. I loved Family Ties as a kid but I don't think I've ever seen an episode since it went off the air. This was a nice trip down memory lane and a great way to celebrate a great TV show.